« It’s Too Damn Startling #4! I’ll just throw this out there– you’ve got to have some chutzpah to title your album “G(fill in your name)d’s Music,” no matter if you leave the “o” out or not. It’s a gutsy move; “God” is probably the most pre-loaded word in the English language. Even an atheist like myself seems compelled to find some sort of “stance” about such a thing. Of course, rigid beliefs don’t hold too well in an artistic setting. Oftentimes; the ridiculous, the absurd, or the magical are simply too fruitful a foundation of artistic exploration to be jettisoned regardless of their uselessness in other areas of life. Satan is one of my all-time favorite movie characters, endlessly explored with so many fascinating variations. Islamic architecture gives me a hint of some infinite, alien, mathematical fright I also enjoy. Looking at an album essentially titled “God’s Music,” I want to know– what DOES God’s music sound like?That’s where Sabrina Siegel turns the listener’s expectations upside-down. With ultra-low bass rumbles threatening to pull my speakers down from their respective walls; the otherwise-natural mix of insects, airplanes, and woodland sounds initially seemed a bit out of place. Early on, I found myself paying attention to one side or the other of this dichotomy… either focusing on the heavy subsonic damage puffing gusts of air at my head, or allowing myself to be pulled into the is-it-live-or-is-it-electronic world arranged so delicately among these monolithic bass noises. In my initial listen, at least 20 minutes has elapsed before I started being able to hear these sounds together– not a fault of Siegel, but more a function of my disbelief– it doesn’t take a genius to imagine that this is Siegel’s comment on the weakness of perception, with an aural elephant in the room popping in and out of focus. Setting aside the equally-interesting Planck Epoch for a moment, I’ve got to say that this is a pretty cool couple lines. It is similar to what I hear in Siegel’s disc, a massive incomprehensible thing moving about its business of creating the earth. 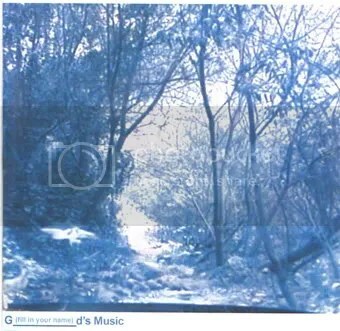 Like other of Siegel’s works, there is a very raw quality to “G(fill in your name)d’s Music”. I suspect that Siegel is less concerned with the individual soundings as with the overall “setting” the mix creates, much as a nature enthusiast will not begrudge a scene its occasional rotted leaf or dead bird. All in all, it’s a unique and interesting listening experience that I’d recommend– just be sure to anchor those speakers well unless you also like the sound of falling electronics! This entry was posted on December 21, 2007 at 12:30 pm and is filed under atheism, experimental, experimental music, improvisation, music review. You can follow any responses to this entry through the RSS 2.0 feed. You can leave a response, or trackback from your own site.